Strategy Map or Results Map - Which is Better? Strategy Map or Results Map – Which is Better? Balanced Scorecard Strategy Maps are popular but is a Strategy Map or Results Map better to map and communicate strategy? Peter Ndaa is our regional PuMP Partner for Africa. With his colleagues at BSEA, Peter has years of deep experience in both Balanced Scorecard and PuMP implementations. Peter has always seen a clean relationship between the two approaches, using the Balanced Scorecard for strategy design and PuMP for measuring and cascading and executing that strategy. And he has some very clear thoughts about how the two maps correlate. How does the correlation between a Results Map and Strategy Map work? But where are the Results Map’s blue and orange layers in the Strategy Map? Peter explains that as a corporate Strategy Map captures outcomes only, it does not include both process and in-process results. To rely on a Strategy Map to communicate strategy organisation-wide, you’ll need both the corporate and cascaded Strategy Maps. People get disengaged because they can’t see the clear line of sight from their results or goals, through to the organisation’s ultimate purpose and value proposition, like they can with a Results Map. Tenuous or even invalid links can be created from a cascaded Strategy Map to the corporate Strategy Map, but it’s not obvious to see this, like it is in a Results Map. 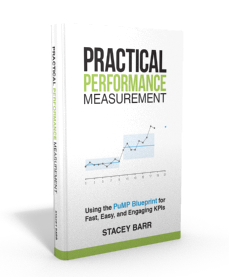 It’s difficult to build a story of performance, by following the relationships among the measures of the strategy, which are clear in a Results Map. So which map works better? Just because a tool like the Strategy Map has been around for long time and used by famous companies, it doesn’t mean it’s still the best way to map, communicate and engage people in strategy execution. Just because the Strategy Map is famously used, doesn’t mean it’s the best way to map and communicate strategy. How have Strategy Maps worked in your organisation? What are your thoughts on their limitations and strengths? Where most organisations go wrong is that they might have a strategy, but they do not have a strategy execution plan which is something very different. From the plan come the critical initiatives to deliver the strategic objectives for the management team. They in turn identify their own KPIs to keep them on track and ensure that results and strategy remain aligned. So, you need both a strategy map and a Results map which are joined at the hip! So Mike, you don’t see the Strategy Map and the Results Map as tools doing the same thing, but in different ways? I do. The initiatives you talk about don’t exist inside either map, because they are the actions, not the results. We put boxes around the outside of Results Maps for initiatives, to show which *results* they impact in the map, at whatever level of the strategy they are targeted at. This helps with the alignment of action to result. I so agree with Peter. The power of the Results Map is that it forces you to define the relationships between the various measures. This is hard to do and requires thought and the input of many to get all the relationships right. But the payback is enormous. So do the hard work and reap the benefits! Thanks Mike. With you extensive experience in this field, I’m always comforted when your views align with mine.